As a parent, you want your children to be safe at all times. You definitely want your child safe while they’re in the family car as anything can happen at any time, which is where a car seat comes into play. While safety is at the forefront of the things that you seek in a car seat, you also want one that looks nice, one that will let your child rear-face until they’re older (3 or 4 years of age) and face forward in a harness at the age of 5. You also want to do all of this at a budget friendly way. This Evenflo SureRide DXL convertible car seat review will break down the pros, cons, technical specs as well as the installation details so you can make an informative choice. Parents should consider the Evenflo SureRide DLX convertible car seat. 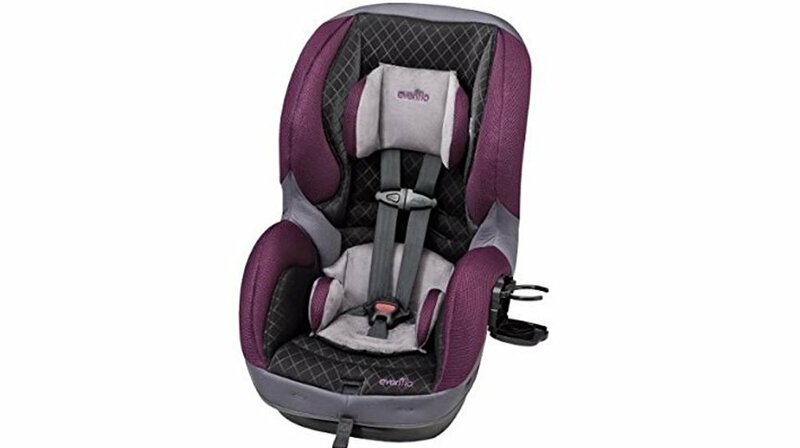 Not only can you get this car seat at an inexpensive price, but you’ll also keep this car seat until your children are in elementary school. Many parents don’t want to buy another car seat until their child can fit into a booster seat, which is usually around the age of 5. If this is the case, then the Evenflo SureRide DLX convertible car seat is perfect. To install the seat in a rear facing position, engage the recline foot to make a good angle. If your car’s seats are at a steep slope and you need a bit more recline to install the seat, use a towel or blanket under the recline foot. Make sure that you install the seat so that the line of the recline that’s on the side of the car seat is at the same level as the bottom of your vehicle. This particular car seat is on the tall side, so it’s going to take up a lot of space in your back seat. Therefore, this car seat may not be the best solution for compact cars. Installing this seat tends to be an easy process. However, taking the LATCH strap from the path that faces your child forward to the path that points your child to the rear of your car can be a hassle. To top it all off, when you take this car seat out of its box, the LATCH strap is looped through the forward facing belt path. If you have a newborn or younger child on your hands, you’ll have to move the strap before doing anything else. However, moving the strap isn’t too difficult. When installing the SureRide DLX car seat, lift the cover off of the seat and thread the LATCH strap under the harness straps that you can usually find in the lap area. Take care not to interlace the straps. Unfortunately, the white strap that holds the LATCH strap to the car seat grips the LATCH very tightly. It makes you want to cut off the first strap, just so that you can free up the LATCH strap. This car seat can fit most children between 5 and 65 pounds. If you have a younger child on the lower end of that line, you’ll find that the fit is great. The SureRide has a wide range that it needs to properly fit, so the harness is fitted with 2 loop sets so that parents can shorten it for their babies. If you have a baby that weighs up to 10 pounds, you can actually shorten the buckle and thread it from the rear into a front facing slot. Unfortunately, this car seat has a big gap between the 3rd and 4th harness slot sets. This can cause a slightly uncomfortable fit on children who are facing the rear of the vehicle. While you might be able to do some experimenting on your end to remedy this problem, other parents have found that there’s not much they can do about this situation other than facing their child forward. However, due to safety concerns you shouldn’t do this unless the harness absolutely won’t stay on their shoulders. The good news is that parents can easily remove the cover from the car seat. Just throw it into the washing machine and dry it in your dryer. Clean the harness with a damp cloth. The SureRide is extremely lightweight and is FAA approved. The car seat won’t adjust to a full recline on a rear facing seat. This shouldn’t bother you unless you have a newborn baby that will need this feature. Some parents have also found that the car seat will not fit through the airport x-ray machines. If you plan on flying with the SureRide, arrive at the airport early to account for inspections. Is The Evenflo SureRide DLX Convertible Car Seat Worth It? The short answer: The SureRide is a lightweight, affordable and great looking car seat that will keep your children safe when they are in the car with you. While there are a few misses that make installation and use more of a pain, you’ll find that the SureRide offers you and your child many advantages that can be hard to find in other car seats at this price point.